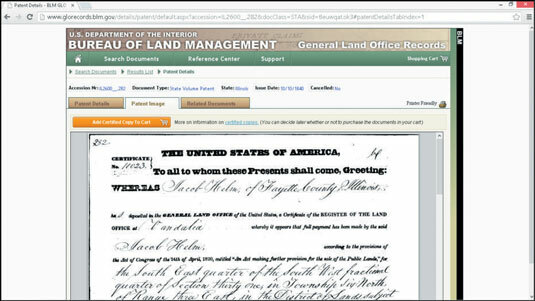 Land resources are among the most plentiful sources of information for genealogy research in the United States. Although a census would have occurred only once every ten years on average, land transactions may have taken place multiple times during that decade, depending on how much land your ancestor possessed. These records don’t always contain a great deal of demographic information, but they do place your ancestor in a time and location, and sometimes in a historical context, as well. For example, you may discover that your ancestors were granted military bounty lands. This discovery may tell you where and when your ancestors acquired the land, as well as what war they fought in. Your ancestors may have received land in the early U.S. in several ways. Knowing more about the ways in which people acquired land historically can aid you in your research. Your ancestor may have purchased land or received a grant of land in the public domain — often called bounty lands — in exchange for military service or some other service for the country. Either way, the process probably started when your ancestor petitioned (or submitted an application) for the land. Your ancestor may have also laid claim to the land, rather than petitioning for it. If the application was approved, your ancestor was given a warrant — a certificate that allowed him or her to receive an amount of land. (Sometimes a warrant was called a right.) After your ancestor presented the warrant to a land office, an individual was appointed to make a survey — a detailed drawing and legal description of the boundaries — of the land. The land office then recorded your ancestor’s name and information from the survey into a tract book (a book describing the lots within a township or other geographic area) and on a plat map (a map of lots within a tract). After the land was recorded in the tract book, your ancestors may have been required to meet certain conditions, such as living on the land for a certain period of time or making payments on the land. After they met the requirements, they were eligible for a patent — a document that conveyed title of the land to the new owner. If your ancestors received bounty lands in the U.S., you might be in luck. The Bureau of Land Management (BLM), General Land Office Records holds more than 5 million federal land title records issued between 1820 and the present, and images of survey plats and field notes from 1810. Go to the Official Federal Land Records site. In the green bar at the top of the page, click Search Documents. 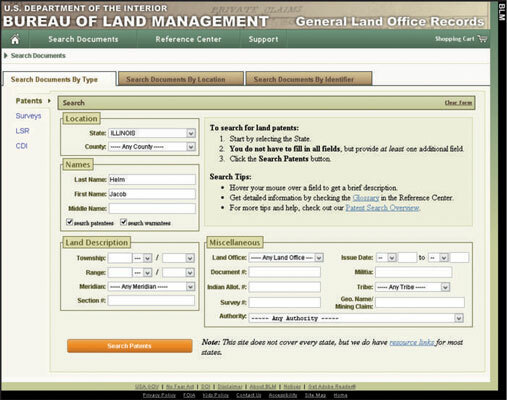 This brings you to a search form that you can fill out to search all of the contents at the BLM site. Matthew’s interest, for example, is in finding land that one of his ancestors, Jacob Helm, owned in Illinois. Click the Search Documents By Type tab on the top of the form. The other tabs are Search Document By Location and Search Documents By Identifier. Click Patents on the left side of the form. The other options are Surveys, LSR (Land Status Records), and CDI (Control Document Index). In the Locations section of the form, use the drop-down list to select a state and, if desired, a county. For this example, select Illinois for the State field, and use the default Any County in the County field. In the Names section of the form, type a last name and first name in the appropriate fields. Type Helm in the Last Name field and Jacob in the First Name field. If you have other criteria for your search that fits in the Land Description or Miscellaneous sections, you can enter it now. For the example, you don’t know much else than the state and name, so you don’t provide any other search criteria. Click the Search Patents button at the bottom of the form. Scroll through the results and choose one that looks promising. If you want to go directly to the image of the document, click the Image icon. But if you want additional information about the record, click the Accession link. You want as much information about the record as possible, so click the Accession link for the single result for Jacob Helm in Illinois. This opens a page with three tabs: Patent Details, Patent Image, and Related Documents. The view defaults to the Patent Details tab. Review the information provided. Depending on the specific record, this detailed entry provides information such as name on the patent, the land office involved, mineral rights, military rank, document numbers, survey data, and a land description. Click the Patent Image tab to view a digitized copy of the patent. You can view the document as a PDF within the frame. You can then save the copy of the document on your computer. If you’re interested in learning about your ancestor’s neighbors, click the Related Documents tab. A list of other documents with the same land description — township, range, and section — generates. You can use this list to see who your ancestor’s neighbors were and learn more about them.